We are taking a short furlough to the States! Ok. I have a lot of news, but this one is the most important right now. We are taking a short furlough to the States, and we are leaving Mexico on August the 24th. Lord willing we will be driving through Monterrey and then to the border. Please pray for us as we drive from Monterrey to the border on the 25th since that 3 hour drive is a little scary right now. Although I have been asking around, and they say it is ok to drive during the day… and believe me, we are driving during the day. We are taking this furlough because of finances. We are living through very exciting times here in Mexico right now. But at the same time our finances are not going well. We are going back to California for the period of four months, from September to December. Please pray that more churches will be willing to take us as their missionaries. The kids are excited as well, we will be able to enroll them in the Christian school in Vista California during the time we are there. Grandpa and grandma are happy for our long “vacation” that we are taking. But actually, we will be very busy going to churches and presenting our work in different places. If you know of a church that is looking into taking “veteran” missionaries in Mexico, please let us know. My cellphone number while in the States is: 760-331-7691. While we go to the States, we are going to “run” a Bible Institute in Mexico. Our last semester we gave 6 hours a week of classes. This time, we are changing our Bible Institute to be in the morning time (from 8:00 am to 12:00 pm). And three times a week. This will make a total of 12 hours a week. We are very excited about this — and a little sad too, because I won’t be here. My brother-in-law Alejandro will be taking over the church during the time we are gone. I am planning to come back to Mexico at least twice to oversee the work and make sure everything is going ok. (I am also suppose to do a wedding on December the 28th). Every three years there is a very special Bible conference in the city of Celaya, Guanajuato. Bro. Alejandro Cordova is the Pastor there. Our plan was to leave Puebla last Monday and go to the conference, but a dear lady of our church passed away and had to postpone our trip for Wednesday. The name of this dear lady is Mrs. Alicia Andrade. She was a Sunday School teacher for 60 years! (before she and her husband came to our church 7 years ago) Imagine what an impact she had in the life of little boys and girls, as they heard Mrs Andrade give out the class. She was 86 years old. Please pray for her husband and family as they go through this difficult time. We were able to hear good preaching in Celaya, and see some good friends during the conference. There were over 3,000 people saved through the soulwinning efforts door-to-door during the conference. Also, there were over 3,000 people that attended the conference from different parts of Mexico. Some even from the US, like my friend Darrell Hurst that pastors in Williamsburg, KY. I bought all the preaching in MP3, and if you are interested, you can subscribe to my podcast in iTunes, as I will be uploading them soon there. This coming Tuesday, we are starting our vacation Bible Schools here in Puebla. This time we are going to held them at three different places. Our goal is to one day have VBS in as much as 50 places or colonias at the same time. Please pray that the kids will come and that a good presentation of the Gospel will be given out. Our VBS run from Tuesday through Saturday, so that Sunday, we can bring them to church and give them their diplomas for attending. We are encouraging moms and dads to come and see their kids receive their diplomas and at the same time present the Gospel to them in case they haven’t heard. Our mission church is going well. Bro. Erik let me know that last Sunday night they had 70 in attendance, with no promotions whatsoever! And that Saturday they had 25 people that came to church to go out soulwinning! How exciting. To God be the glory. Puebla is a big city in need of the Gospel. My prayer is that we can start ten more mission churches in Puebla in the next ten years. Pray that you can too be a part of this! Thank you. This morning we had the privilege to listen to Pastor Ramos preach a really good message in our church about witnessing with boldness. Pastor Ramos has started two churches in Venezuela in the last ten years, and now he is starting a project with the goal to start 70 new churches in Venezuela in the next 15 years. He presented his burden about how this can be done with God’s power and grace. It was a blessing to hear and see what God is doing in Venezuela. I had planned a trip to Venezuela for this last January, but due to finances and some complications that trip was postponed. I hope to visit Venezuela before the year is over. We have two missionaries that we support in that country: Bro. José Luis Fuentes and Bro. Artemio Cid. 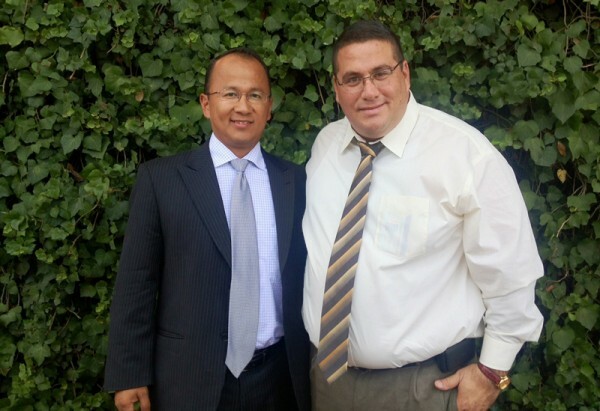 Both of them graduated from San Luis Potosí Bible College and are doing a tremendous work there. Yesterday, during soulwinning, God allowed me to see a young lady saved. Her name is Jeana. Both of my sons, Japheth and David, were with me. This time David said to me: Dad, I liked going out soulwinning with you. It was fun! What a blessing to go out and reach people here in Puebla, specially when the family is with me. We had a good packed church service this morning. We had one first time visitor and two people saved. One of the people that was saved, was a lady, whose son had visited our church for the last four Sundays. His name is Leo. He has invited his mom to come, and she finally accepted! She was very happy to come and to know that Christ can save her soul. She said she is planning to come every Sunday. Some of you know my sister Aglaeé and my brother-in-law Alejandro. Both of them are right now on deputation in the States. Right now in the state of NC. My sister called me this last Saturday to let us know that they just had their third child. She actually called 20 minutes after delivering my new nephew! They named him Samuel. I said that they should name him Arturo, but somehow Alejandro didn’t like “that” name. Please pray for my sister’s recovery and for Samuel. Again, if you would like to contact them, here is their cellphone number. (336) 624-0628 U.S. If your church has a Spanish church were they can present their ministry, that will be a big blessing for them. 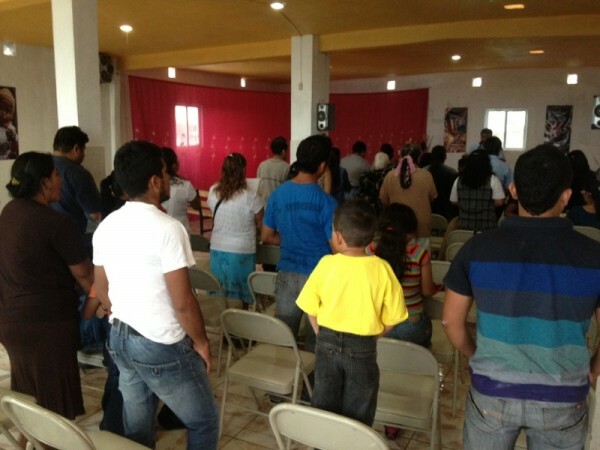 God has called them to the State of Guerrero to start a church. Please pray for them as they try to raise their support.